Trees are wonderful and most of the time we love them. Sometimes, however, they have become a nuisance. Trees and plants can become a weed and when they do it might be time to let them go. Killing them is surprisingly easy and many people do it by accident. Other people are more deliberate and these are some of their methods. Remove the bark around the entire circumference of the branch, tree, or woody part of the plant. 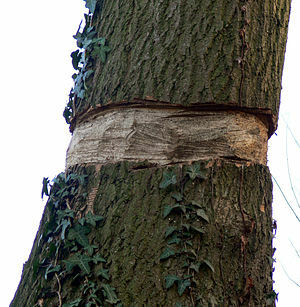 The removal of the cork cambium, phloem, and cambium cuts of the supply of nutrients to the area resulting in death of the branch, tree, or woody area. Ring-barking and girdling are very effective and typically only used in densely forested areas for thinning. The dead trees can become a hazard as have reduced structural integrity and are more susceptible to falling in severe storms. Roots of a tree need to breathe and if they are suffocated the tree will die. It is a common mistake to pave over roots or even mulch too deeply resulting in the slow suffocation of the tree. Salting the earth is well-established folkloric motif in the Middle Ages. It is more than folklore, it is a practice that can kill all vegetation in the immediate area. It works by increasing the soil salinity to a point where nothing will survive. The problem is that it is very difficult to reverse and if you ever want to plant something there it may take lot of effort to restore the soil’s salinity. By far the easiest way to kill a tree. Buy some concentrated herbicide and on hot dry day spray the leaves of the tree. If it is a large tree or stump you should make fresh cuts in the cambium layer of the tree and apply the herbicide immediately. If the tree won’t die from this method try drilling holes into it and pouring in the herbicide to the wound. Cutting the tree down is the preferred method of killing a tree. This is the only way that doesn’t leave an unsightly dead tree on your property. A dead tree can pose serious risks and removal is the only guaranteed way to eliminate the risks. To cut down the tree you should contact an arborist like Sydney Tree Company, or if you are going to do it yourself, start with the outer limbs and continue inward. Once the limbs are removed then you remove the remaining trunk. A herbicide should be applied to the stump to stop regrowth, or it can be ground out with a stump grinder.